Join Angela Walton-Raji this Wednesday in a free webinar entitled Best Internet Resources for African American Genealogy. Angela is a founding member of AfriGeneas.com and specializes in information for beginners via daily and weekly online genealogy chats at AfriGeneas. The webinar will be live on Wednesday, August 31, 2011 at 2PM ET. Internet sites are often sought when beginners start exploring family history. The challenge is where to turn to when researching African American ancestry. This webinar examines resources that provide guidance for the unique problems facing descendants of slaves. The webinar begins with a full introduction to Afrigeneas, the oldest continually operating African American genealogy website. From daily online chats and over 20 message boards, the visitor to this site finds a community of volunteers to provide assistance with their beginning research problems. Afrigeneas provides unique resources such as the slave database and a searchable archived message database that retrieves African American genealogical queries back to 1997. Popular subscription sites like Ancestry and Footnote are among useful sources for primary source documents such as emancipation records, service records of US Colored Troops and more. But free sites provide good resources like Cyndi's List and USGenweb which provide sound links to other African American sites and one extremely useful resource is found on the ever popular FamilySearch. AfriGeneas has also joined the genealogy blogging community. Blogs are continually surfacing reflecting personal research journeys, while weekly columns and podcasts provide advice for research challenges. In addition one can also find basic instructional videos for African American research as well. There are many options to be found online, and the African Ancestored researcher will have an abundance of resources to offer a hand in providing tips, suggestions, and instruction. The live webinar is scheduled for Wednesday, August 31, 2011, so register today to reserve your virtual seat. Registration is free but space is limited to the first 1,000 people to join that day. On this day in 'tech history' . . . Windows 95 was released after lots of consumer hype and 'midnight madness' events. On another non-tech note, the people from Pompeii are still digging out 1,932 years after the eruption of Mount Vesuvius. If you haven't "circled" him yet, he's a great one to follow. Here's his page. Dan was one of our presenters in last week's Google+ the Next Big Thing webinar. He is also the author of the award-winning book, Google Your Family Tree. Dan also publishes the Google+ for Genealogists blog. James Tanner's new book, The Guide to FamilySearch Online, PDF Edition, is now available for the first time ever in digital format from our online store for the introductory price of just $19.95 (a savings of $5). Its 369 pages provides detailed instructions to using all of the current FamilySearch websites. FamilySearch cannot be ignored by knowledgeable genealogists. During the past few years, FamilySearch has grown into one of the largest and most important genealogical resources on the Internet. The Guide to FamilySearch Online will take you on a tour of all of the fabulous collections of records and resources. You will find insights into features and information you likely did not know existed. Click here to view the entire Table of Contents. James L. Tanner has 30 years of experience as a research genealogist. He practiced law as a trial attorney for 37 years and is now nearly retired. He is also a professional photographer and writes blogs on genealogy and photography. His genealogy blog, Genealogy's Star, has been selected as one of the Top Forty genealogy blogs by Family Tree Magazine. He has been a featured Blogger at genealogy conferences and was most recently a featured blogger at the RootsTech Conference in Salt Lake City, Utah. He has been very involved in teaching and using the FamilySearch websites for years as a volunteer at the Mesa Regional Family History Center in Mesa, Arizona. He is the father of seven children and 31 grandchildren. Here are last month’s questions. Is it harder on your photos to scan or use a copier? Are DVDs a good way to preserve photos? What is the best way to digitize and share with siblings grandmother's photograph and scrapbook albums? Would a food dehydrator work for drying photos,etc? What is a good way to store the negatives of photos? Can you use kitchen baggies for storage of photographs and family items? Are those space bags (the ones that you use a vacuum cleaner with) good for storage? Do you recommend using a special kind of cleaner on photos, such as is sold by companies that also sell acid & lignin free preservation/storage products? What can I do with my old glass negatives? Can I get an image from them? My question was how can I tell if 2 pictures I have that were taken years apart are the same person? Maureen Taylor is an internationally known photo identification expert. She combines her expertise in genealogy, history, and costume to solve family picture mysteries. Taylor has been recognized in The Wall Street Journal, NBC’s Today Show, ABC’s The View, and NPR. She is the author of a number of books and magazine articles including The Last Muster: Images of the Revolutionary War Generation (Kent State University Press) and Fashionable Folks: Hairstyles 1840-1900 (Picture Perfect Press). Watch her videos at www.maureentaylor.com and on Vimeo. She is also the presenter of Google Images and Beyond and Preserving Family Photographs. Sale - 25% off "Social Networking for Genealogists"
For a limited time, Drew Smith's 129-page soft-cover book, Social Networking for Genealogists, is available at 25% off. Click here to purchase for just $14.21. Regular price is $18.95. This book describes the wide array of social networking services that are now available online and highlights how these services can be used by genealogists to share information, photos, and videos with family, friends, and other researchers. Each chapter guides you through a unique category of social networking services using genealogy-related examples. From blogs and wikis to Facebook and Second Life, author Drew Smith shows you how to incorporate these powerful new tools into your family history research. Destined to become a classic, this 129-page book is about the type of social networking that has been made possible by the development of international computer networks, the availability of network access to most homes (especially broadband access), the creation of websites dedicated to particular kinds of networking (posting photos, viewing and commenting on videos, seeing what books friends have in their libraries, etc. ), and the ease of participating in these sites without having to be a computer expert. More to the point, this book is inteded to identify those kinds of social networking sites and services that will be of the most interest to genealogists. The special discount coupon of google that was announced during the webinar is valid for 10% off anything in our online store through Tuesday, August 16, 2011. Monday's webinar, "Google+ the Next Big Thing" has set new registration records - over 3,600 of you from 72 difference countries have registered. Terrific! While our webinar software (GoToWebinar.com) allows unlimited registrations, it only has 1,000 virtual seats for the live session - so the first 1,000 to join on Monday will get in. If you get a message that the webinar is full, you can watch it over at www.hangoutongplus.com - thanks to FamilyLink.com for making this happen. 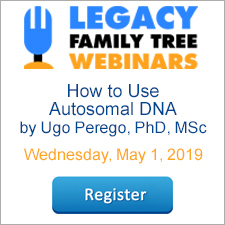 Live via GoToWebinar - register at www.LegacyFamilyTree.com/webinars.asp and click on the Join Webinar link in the email confirmation you receive after registering. 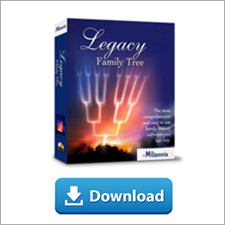 View the recording in the webinar archives at www.LegacyFamilyTree.com/webinars.asp a couple of hours after the live event concludes. Pre-purchase the webinar-on-CD for just $9.95 (the live session is free and will be available in the archives for at least 10 days). Join these three leaders in Google technology as they get together to put on what we think will be one of the best webinars ever. Learn about Circles, Hangouts, Streams, Sparks and more. The webinar will be live on Monday, August 15, 2011 at 2PM ET. Paul Allen, the Founder of FamilyLink.com and Ancestry.com has quickly become known as the unofficial Google+ Statistician. His expert use of posting in Google+ features, stats and using his own insider tricks have helped to make a huge impact on the initial success of Google+. Those who are part of Paul's Circles have already benefited from his expertise. Paul's fame has quickly grown and he currently has more than 22,000 followers on Google+. Dan Lynch, a.k.a. "Mr. Google" is a technology marketing consultant, professional genealogist, and popular international speaker. One of the first to recognize Google's strengths for family history research, Dan authored the award-winning book "Google Your Family Tree", and is already helping the genealogical community understand the benefit of Google+ (see his blog at http://GooglePlusforGenealogists.com). Mark Olsen is the Marketing Manager for FamilyLink.com and holds a degree in genealogy. Mark is another famous name on Google+ as he is currently hosting the longest ever Google Hangout, nearly one month of a continual hangout. Mark is one of the leading experts on Google+ Hangouts and has been learning how to better connect families and genealogists around the world. His current Hangout has been receiving a lot of positive press and has had visits from many well-known industry leaders. The live webinar is scheduled for Monday, August 15, 2011, so register today to reserve your virtual seat. Registration is free but space is limited to the first 1,000 people to join that day. If you get a message that the webinar is full, it will also be broadcast live at http://hangoutongplus.com.